Nobivac Myxo-RHD provides protection against Myxomatosis and also Rabbit Haemorrhagic Disease. A single injection is adequate, but must be repeated every 12 months. Myxomatosis is transmitted between rabbits by biting insects which may travel a long distance, so it is possible for domestic rabbits to pick up the disease from wild rabbits even when there is no apparent contact between them. The virus which causes RHD can be transmitted on clothing, footwear, feeding utensils etc so rabbit handlers must be aware that accidental transmission to non-vaccinated rabbits is possible. Both diseases are regarded as common in wild rabbits in the UK. 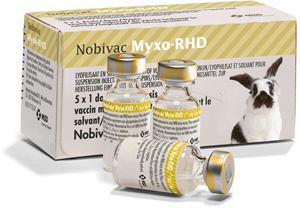 Nobivac Myxo-RHD is injected under the skin any time from 5 weeks of age, with immunity being regarded as effective after 3 weeks. Active substance: Live myxoma vectored RHD virus strain 009: ≥103.0 and ≤106.1 FFU*. Excipients: For the full list of excipients, see section “Pharmaceutical Particulars”. Reconstituted product: off-pink or pink coloured suspension. For active immunisation of rabbits from 5 weeks of age onwards to reduce mortality and clinical signs of myxomatosis and to prevent mortality due to rabbit haemorrhagic disease (RHD) caused by classical RHD virus strains. Rabbits that have been vaccinated previously with another myxomatosis vaccine, or that have experienced natural myxomatosis infection in the field, may not develop a proper immune response against rabbit haemorrhagic disease following vaccination. A transient temperature increase of 1 - 2 °C can commonly occur. A small, non-painful swelling (maximum 2 cm diameter) at the injection site is commonly observed within the first two weeks after vaccination. The swelling will resolve completely by 3 weeks after vaccination.. In pet rabbits, in very rare cases, local reactions at the injection site such as necrosis, scabs, crusts or hair loss may occur. In very rare cases serious hypersensitivity reactions, which may be fatal, may occur after vaccination. In very rare cases the appearance of mild clinical signs of myxomatosis may occur within 3 weeks of vaccination. Recent or latent infection with field myxoma virus seems to play a role in this to a certain extent. Studies involving the use of the vaccine during early pregnancy were inconclusive, therefore vaccination is not recommended during the first 14 days of pregnancy. No safety study on the reproductive performance has been conducted in male rabbits (bucks). Therefore, the vaccination of breeding bucks is not recommended. After reconstitution, administer 1 dose of vaccine by subcutaneous injection to rabbits from 5 weeks of age onwards. Single dose vial Reconstitute a single dose vial of vaccine with 1 ml of Nobivac Myxo RHD solvent and inject the total contents of the vial. In addition to the adverse reactions observed after single dose vaccination, a mild swelling of the local lymph nodes may be observed within the first 3 days after overdose vaccination. Pharmacotherapeutic group: live viral vaccine, ATCvet code: QI08AD. To stimulate immunity against myxoma virus and rabbit haemorrhagic disease virus. The vaccine strain is a myxoma virus expressing the capsid protein gene of rabbit haemorrhagic disease virus. As a consequence rabbits are immunised against both myxoma virus and rabbit haemorrhagic disease virus. After infection with virulent myxoma virus some vaccinated animals may develop a few very small swellings, especially on hairless places of the body, which quickly form scabs.The scabs usually disappear within 2 weeks after the small swellings have been observed. These scabs are only observed in animals with active immunity and have no influence on the general health, appetite or behaviour of the rabbit. Lyophilisate: Hydrolysed gelatine, Pancreatic digest of casein, Sorbitol, Disodium phosphate dihydrate. Solvent: Disodium phosphate dihydrate, Potassium dihydrogen phosphate and Water for injections. Do not mix with any other veterinary medicinal product, except the solvent supplied for use with the vaccine. Shelf-life of the lyophilisate as packaged for sale: 2 years. Shelf-life of the solvent as packaged for sale: 1 ml and 10 ml glass vials: 4 years. 50 ml PET vials: 2 years. Shelf-life after reconstitution according to directions: 4 hours. Lyophilisate: Store in a refrigerator (2 °C - 8 °C). Do not freeze. Protect from light. Solvent (50 ml PET vial): Store in a refrigerator (2 °C - 8 °C). Do not freeze. Solvent (1 ml and 10 ml glass vial): No special precautions for storage. Do not freeze. Lyophilisate: Glass vial of 1 or 50 doses with a halogenobutyl rubber stopper and aluminium cap. Solvent: Glass vial of 1 ml or 10 ml, or polyethylene terephthalate (PET) bottle of 50 ml with a halogenobutyl rubber stopper and aluminium cap. Plastic box with 5 x 1 dose vial of vaccine and 5 x 1 ml vial of solvent. Plastic box with 25 x 1 dose vial of vaccine and 25 x 1 ml vial of solvent. Cardboard box with 10 x 50 doses vial of vaccine + cardboard box with 10 x 10 ml vial of solvent. Cardboard box with 10 x 50 doses vial of vaccine + 2 x cardboard boxes each containing 1 x 50 ml vial of solvent. Below are some recent questions we've received regarding Nobivac Myxo-RHD Vaccine for Rabbits, including answers from our team. Does this product protect my rabbit from rabies? Just had his injection and he is going to live in France in a few weeks. Nobivac Myxo-RHD provides protection against Myxomatosis and also Rabbit Haemorrhagic Disease only. Does this product come supplied with syringes or do we need to purchase them separately ? Syringes and needles are not included, they must be bought separately. Each rabbit is normally vaccinated using a 1ml syringe, but a larger syringe can be used to add the solvent if the multidose size is being used. Needles I would recommend are often 23g x 5/8", which are available on the website. HI will you be getting the new vaccine when it comes into the UK later this month please? Also is the current myxo-VHD vaccine available in the 50 dose bottle at all? We buy our veterinary drugs through the standard veterinary wholesalers. We expect to be able to supply this new vaccine as soon as it is released to the wholesalers. The 50 dose pack is not listed by our wholesalers so we cannot supply it unfortunately. This is down to the discretion of your own vet. Your vet should legally provide a prescription on request if he/she feels that the medication is appropriate and you are competent to give it safely and effectively. If your vet has any doubts about those things, then your vet should not give you a prescription. Vets are in fact often influenced by the commercial aspects of handing out prescriptions - they make a lot of money from administering vaccinations themselves. This should not be part of their decision-making in fact, but they are human. You will need to discuss the whole issue with your vets and see what they say.